I'm really putting myself out there sharing all my most weirdest geekiest wishlist with you, but I felt the need to share and be more myself on my blog! Now if you REALLY know me you know I'm a big fan of pokemon, cute things, characters of all sorts, dogs, and basically when I like something - I really like it! And if I can wear it, I will probably want it! Take the Pikachu onesie for example - I could BE a Pikachu. It's simple as, and any Pokemon Masters out there like me will understand. The Charizard snapback is just epic - and I've been after a super over the top decoden phone case for ages, and this one has caught my eye for a very long time. 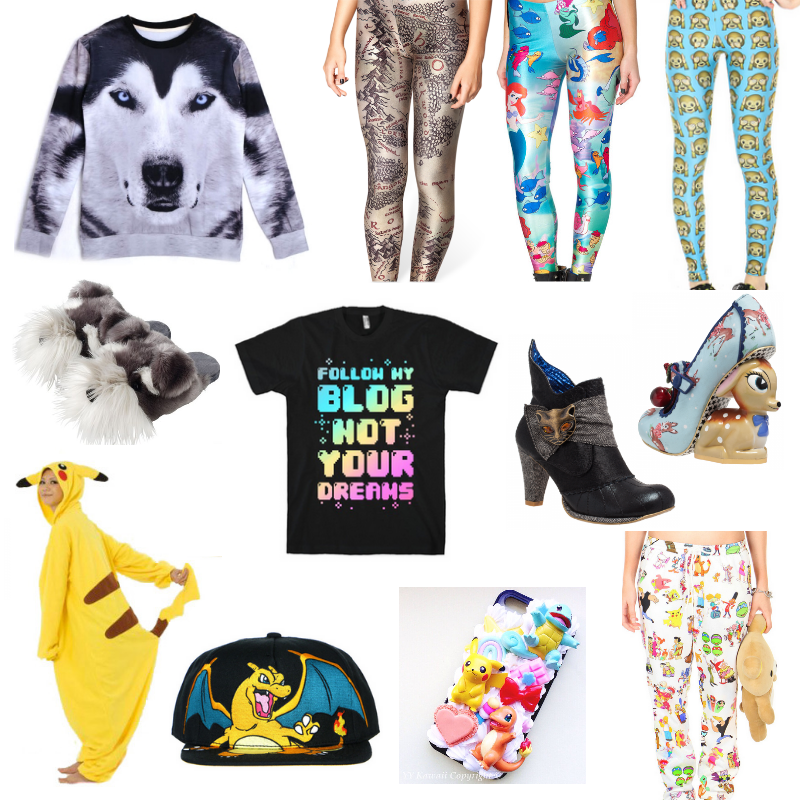 Puppies are my first favourite here, and probably the more accepted wearable character on this wishlist! I saw this super cute sweater on OASAP and I just love the idea of having a big husky face on my top... And then schnauzer faces on my feet! If it doesn't get any weirder, we have the 90s TV cartoons all on a pair of amazing sweatpants - which lets face it, is too crazy for the public but good enough for lounging in at home. The likes of Dexter and Johnny Bravo appear on there... It's like Cartoon Network exploded on them. Lastly, and probably my most sincere and realistic want here (apart from the Pikachu Onesie - that's number 1) are a pair of Irregular Choice shoes. I've always always always wanted the Miaow boots, and figured one day they may hit the sale, since I could never grasp the idea of paying over £100 for a pair of shoes. But I may just have to give in to my year in year out want and get them. In the black of course, so I could wear them with everything! And the Cherry Deer shoes are just beautiful and quirky in the best way - they'd look great with jeans and a simple tee to for everyday wear or with a dress for a prettier look! Share with me your most weirdest or geekiest want right now in the comments below, show me I'm not the only one with a geeky wishlist! Whether it be the burger clutch from New Look or something as ridiculous as emoji leggings!